Leading purchase consideration among those looking for a new car is cabin quietness. Now Ford comes up with a better way to make its vehicles even quieter – mobile aeroacoustic wind tunnel. The world’s first fully mobile aeroacoustic wind tunnel is an innovative, patent-pending test system that allows for sources of unwanted wind noise in early production vehicles to be identified faster and solutions developed sooner. The Patent-pending tunnel can produce wind speeds up to 80 mph, then be broken down and reassembled in just hours at any Ford assembly plant in North America! 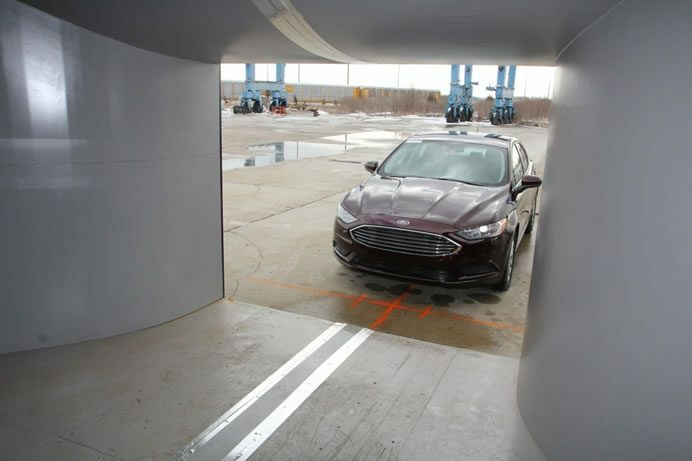 Full-sized aerodynamics labs, such as Ford’s main wind tunnel in Allen Park, Michigan, are outfitted with the latest in sensitive measuring and analysis equipment. These office building-sized facilities are specialized for advanced aerodynamic and aeroacoustic development work on future models, with each facility costing about $50 million. Due to the specialized instruments and cost, running time for these machines is precious.Ford’s new mobile wind tunnel costs a fraction of what a full-sized lab costs. Because testing requires only a steady stream of highway-speed wind, many of the large and sensitive instruments of a full aero lab aren’t required. But high-tech, in-cabin sensors like the Aachen head and Noise Vision can still be used. Ford’s new wind tunnel debuts at Flat Rock Assembly Plant in Michigan – joining a growing fleet of mobile testing facilities including three environmental evaluation chambers. 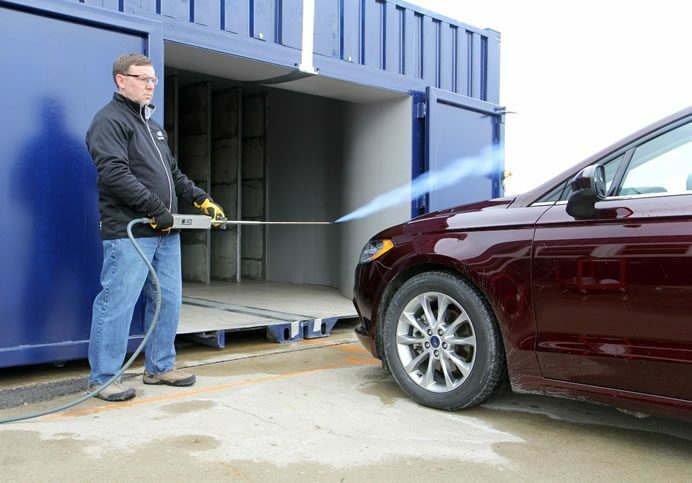 With an on-site wind noise facility, Ford factories can pull more sample vehicles directly from the line and test them with no delay – eliminating the time and complexity of shipping vehicles back and forth across the country.